On my way back from the Dronning Maud Land in Antarctica, where I was for the November 23-24, 2003 Total Solar Eclipse, I had already decided to return for the next eclipse in Antarctica. 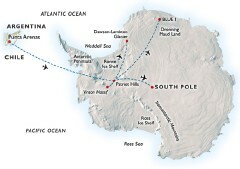 Moreover, this eclipse could be observed from Antarctica’s highest peak, one of the world "Seven Summits". To observe the annular solar eclipse on Thursday 2008 February 7, we are planning an expedition to bring up to 6 climbers and 20 eclipse chasers together at Mount Vinson. Your journey begins in the Chilean city of Punta Arenas from where we fly directly across the Drake Passage to the ice runway of Patriot Hills in Antarctica. 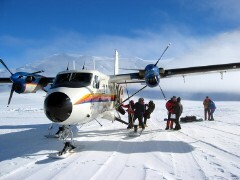 Then for the final dash, Twin Otters will take you to the 2,100 m (7,000 ft) Mount Vinson Base Camp where the climbers will start the ascent of the highest peak in Antarctica (4,897 m — 16,067 ft); the rest of the group will be offered activities around the Base Camp, plus an optional visit at South Pole Amundsen-Scott research station (view the embroidered patch). This odyssey will take up to three weeks for the climbers and two weeks for the eclipse enthusiasts for an estimated per person cost of 28,000 € (USD 35,000). The eclipse in Patriot Hills will only be partial with 91% obscuration. Another total solar eclipse will occur in Antarctica on December 4, 2021 and will be visible from Patriot Hills, but however only partial at Mount Vinson. And on 2076 January 6, a total eclipse will occur right on the summit. Sponsors, partners and equipment suppliers are most welcomed : guides are available in HTML or PDF format. Thank you all in advance for your support and help. 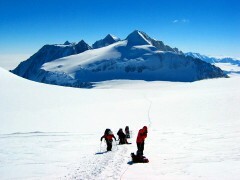 A scouting trip including the Vinson ascent, one of the very coveted "Seven Summits", will ideally be done at the beginning of 2007. 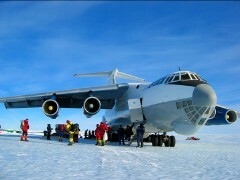 Since this unique opportunity occurs during both the International Heliophysical Year (IHY 2007) and the International Polar Year (IPY 2007-2008) such sponsoring will enable experiments to take place at Mount Vinson. Come and visit us in March 2007 at the Berlin International Tourism Fair (ITB 2007). Members of the Official Secret Society of Antarctic Solar Eclipse Chasers (OSSASEC) should get prepared for another adventure to Antarctica. Those who missed the opportunity to view the 2003 November 23-24 Total Solar Eclipse are most welcomed. 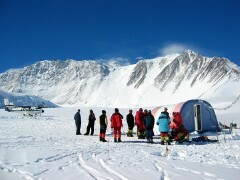 Eclipse enthusiasts will be offered a unique opportunity to observe a deep Annular Solar Eclipse at the Mount Vinson Base Camp and assist to my ascent expedition to observe the whole eclipse from the summit with a small group of climbers. For those wishing to climb, please contact me at this address as soon as possible: space limited to 6 climbers. 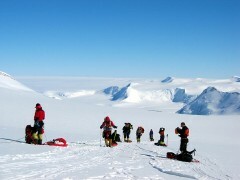 To climb the 4,897-meter Mount Vinson you need to be in excellent physical condition. 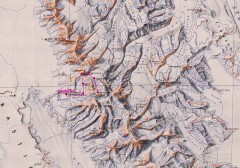 It is a glacier climb of moderate difficulty. You should have some experience walking with an ice axe, using crampons and doing self-arrest. Most of the terrain is low angle, but summit day is long and has one 50° slope. Temperatures are cold, below -20°C (0°F) for the entire trip and down to -40°C (-40°F) at the summit. Temperatures of -70°C (-95°F) with some windchill can be encountered. This is why you must have the right level of commitment. 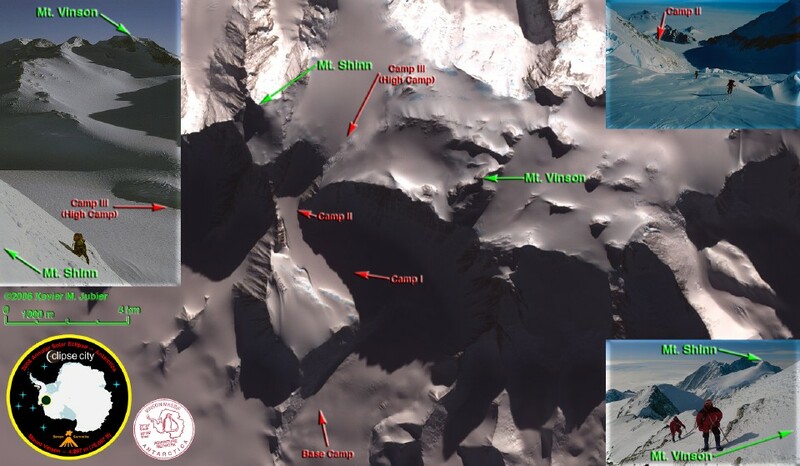 For the others, probably about twenty people, the various animations and the eclipse’s observation will be conducted from the Mount Vinson Base Camp. Each participant on this journey will receive a fleece jacket with this expedition embroidered patch on it. Last page update on January 25, 2005.